As you move up game stakes, it makes sense that you’ll be paying more in absolute poker rake, since you’re playing bigger pots on average and thus more rake will be taken. However, because most poker sites cap the rake at a fixed dollar amount regardless of stakes, you actually pay less rake in terms of big blinds at higher stakes. The more often the rake gets capped, the less rake you pay relative to lower stakes in terms of big blinds. To illustrate, we have compiled the rake data of the top six traffic sites across all stakes and plotted a weighted average (based on traffic) of their rakes in big blinds per 100 hands (bb/100) in the graphs below. Check out the graph of your chosen game to see how your stakes played affects your rake paid. As expected, players at the mircro stakes pay the highest relative rake. Players at 2nl really get hammered at an average of just over 8 bb/100. Things dip a bit at 5nl and decrease only slightly from stake to stake up to 50nl. At these stakes most pots are still not capping the rake so the difference from one level to the next isn’t huge. At 100nl is when things start to drop more significantly, as we see significant drops between nearly every stake from then on. To see the effect moving up stakes has on rake, lets look at an example. Lets say a player at full ring 100nl is winning at 3bb/100 after rake. That means he’s beating the game for 8.15bb/100 because of the 5.15bb/100 rake he must pay. Even with a relatively high winrate, rake is eating up 5.15/8.15 = 63.2% of this player’s profit. If this player moves up to 200nl, where the rake is only 3.77bb/100, he pays significantly less rake than at 100nl. If he is able to maintain the same 8.15bb/100 pre-rake winrate, the rake only eats up 3.77/8.15 = 46.3% of his profit. However, because the game is tougher, its not realistic that his winrate will stay the same. If he can keep the same post-rake winrate of 3bb/100, then his pre-rake winrate is 6.77bb/100 and rake eats up 3.77/6.77 = 55.7% of his profit. Even this may be ambitious, so lets say he only wins at 2.25bb/100 after rake at 200nl. Now rake eats up 3.77/6.02 = 62.6% of his profit. This is still a lower percentage than when this player was winning at 3bb/100 before rake at 100nl. Whats more is that despite having a lower post-rake winrate in terms of bb/100, this player actually wins 50% more money because he is now playing higher stakes. At 200nl he earns $4.50/100 whereas at 100nl he was winning $3/100. This is all despite his pre-rake winrate going from 8.15bb/100 to 6.02bb/100, a 26.1% decrease. Therefore, it is often advantageous to move up in stakes even if your bb/100 is lower at the higher stakes. 6-Max tells a similar story to full ring, only with slightly higher numbers at each stake. 2nl players are once again hammered at 10.4 bb/100 on average. Once again we mostly see small decreases up through the small stakes. 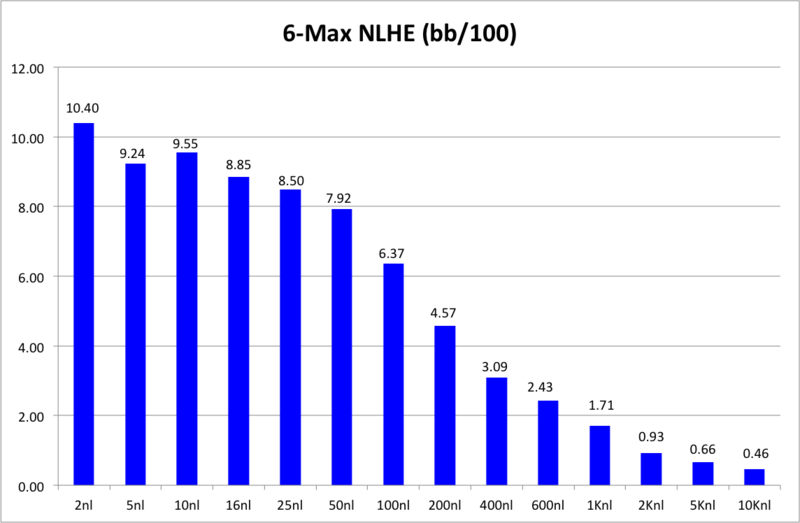 Rake actually increases from 5nl to 10nl, though this is likely an anomoly in the data. 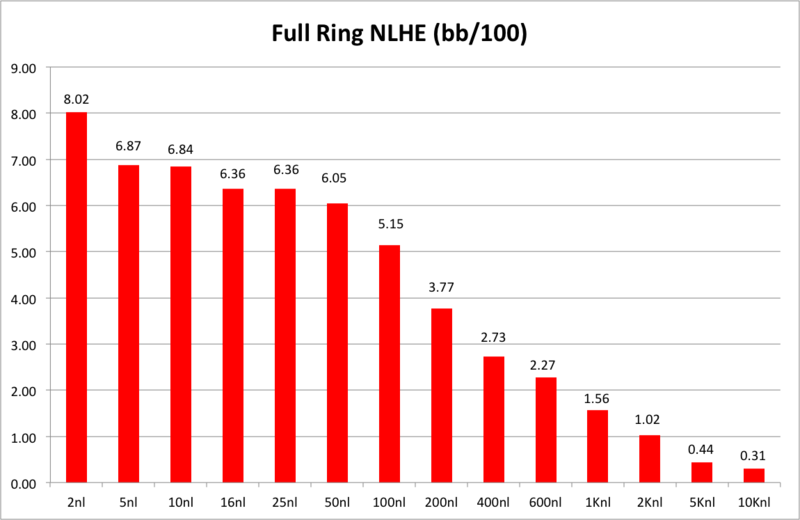 The bigger drops begin once again at 100nl and continue from there as with full ring, dropping fairly significantly up through the higher stakes. To see how important having rakeback is for a player’s profits, lets look at an example player playing 6-max 200nl. Lets say he wins a respectable 2.5bb/100 after rake but has no rakeback deal. Now this player hears about rakeback and gets a 27% rakeback deal on his site. He’s paying 4.57bb/100 in rake, and now he gets .27*4.57 = 1.23bb/100 of that back. Now his winrate jumps to 3.73bb/100, a 49.2% increase, just from signing up for rakeback. Clearly, getting a good rakeback deal can be huge for increasing your winrate. Similar to cash games, tournament rakes drop on a relative basis when moving up stakes as sites generally take a smaller percentage fee for bigger buy-in levels. Lower rake at these levels mean that the ROI required to beat the rake is actually lower. However, high buy-ins tend to attract tougher competition, so this may be harder than it sounds. Depending on site and buy-in level, tournament fees range from 5% up to 17%. Traditional ROI takes rake into account, making a break-even ROI equal to 0%. However, to discuss rake levels we need to use what we are calling return on buy-in (ROBi). This is the same as ROI, but discludes the tournament fees from the investment portion of the equation. This allows us to better compare different stake levels.